We need you – to give resilience.org a facelift! Please consider lending our friends at resilience.org a hand. Their ongoing content curation is stellar and we are truly grateful to them for featuring material from the P2PF blog and Commons Transition. Click here to donate to the campaign. Resilience.org needs your help today. For the last 10 years, we’ve been operating resilience.org on a shoestring, with volunteer hours and small donations from people like you. Despite these limited resources, we’ve published tens of thousands of insightful essays and inspiring stories, and we receive 1.5 million visitors every year. But, with what’s at stake, that simply isn’t enough. We need to reach and mobilize more people – people who, like you, can be armed with a deeper understanding of the crises we face and inspired by the amazing work being done in communities around the globe to build a more resilient, equitable and sustainable world. 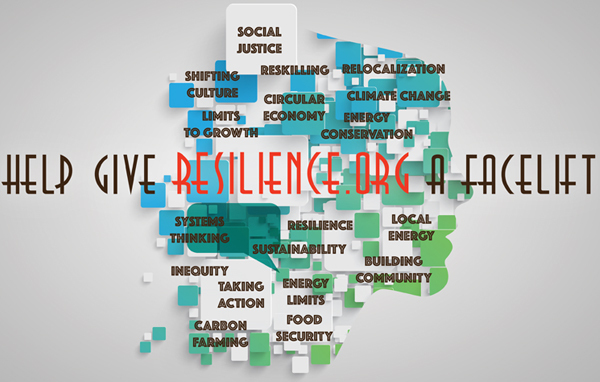 Showcase new voices and content partners, in addition to the incredible contributors resilience.org already publishes. The Threshold Foundation has generously donated a portion of our needs for this effort. But we need your help to raise the remaining $10,000. If you’ve ever considered donating to resilience.org but haven’t yet, we need your help now! If you’re a recurrent donor, thank you! – will you consider upping the ante to get our new site created? Please reach into your pockets today and give a tax-deductible donation of $25, $50, or more. Any amount you contribute makes a difference. Help us bring critical content to more people – we have no time to lose. From your friends at resilience.org.